If you're a fan of crime fiction, these bookshops are definitely worth a trip. 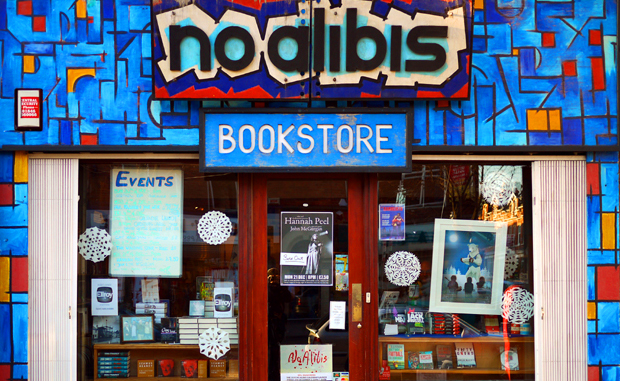 Immortalised in Colin Bateman’s Mystery Men series, No Alibis is Northern Ireland’s only specialist crime fiction store. Whodunits, whydunits, cosies, police procedurals - you name it, they have it and what owner David Torrans doesn’t know about the genre isn’t worth knowing. Hidden behind the hustle and bustle of Leicester Square, Goldsboro Books is a paradise for book lovers. Specialising in signed first editions, they have a passion for crime and thrillers. In June they also host Crime in the Court, a party for crime fiction authors and readers. Do keep an eye out for the loveable dog too! If you prefer your crime and thrillers to be more on the speculative side, a visit to Forbidden Planet is a must. As well as checking out the Sherlock merchandise, investigate their huge library of cult and new fiction in the basement. You will probably bump into an author or two, as they host regular book signings! Visiting Berlin? Why not take a trip to Hammett Krimis, a dedicated crime and thriller store. They have a strong English language section featuring the latest bestsellers and well-thumbed classics plus they have an international line-up of author events. The Poison Pen Bookstore hosts a whopping 200 events a year, from intimate crime and coffee book clubs to talks with the latest crime megastars. You can also watch events on their livestream from anywhere in the world.